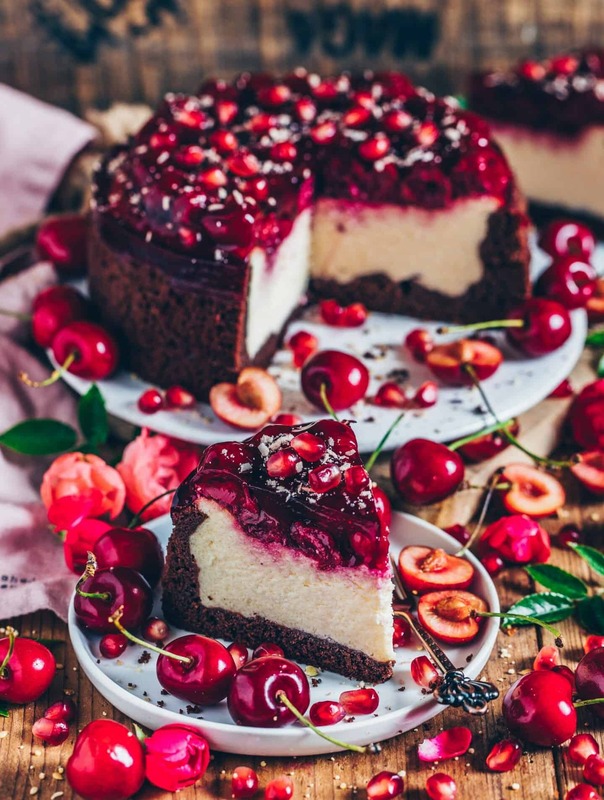 This baked vegan cheesecake with cherries and chocolate crust is a delicious refreshing light cake with a wonderfully creamy filling and juicy topping. Freshly chilled from the fridge, it’s a perfect dessert for warm summer days. This cake is easy to make and dairy-free. 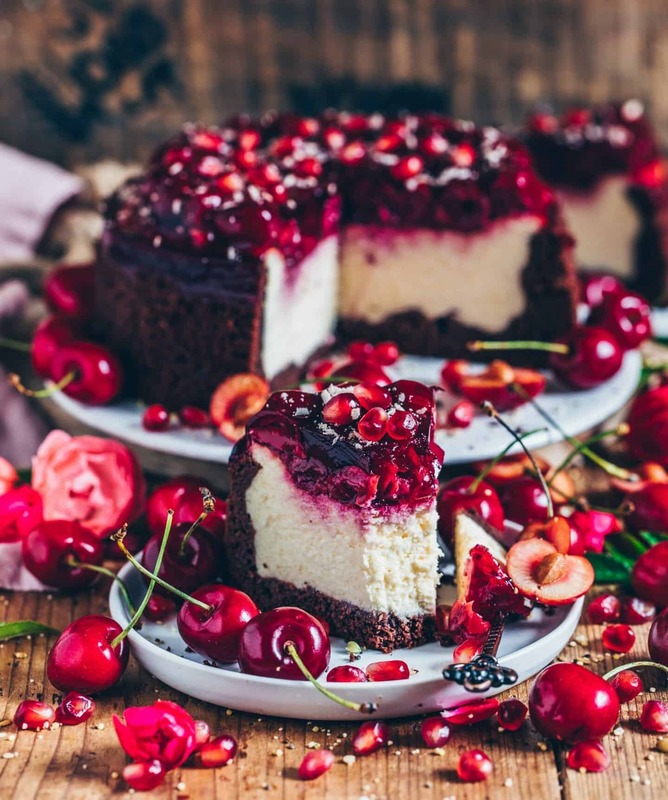 Maybe you already know that I really love cheesecakes? 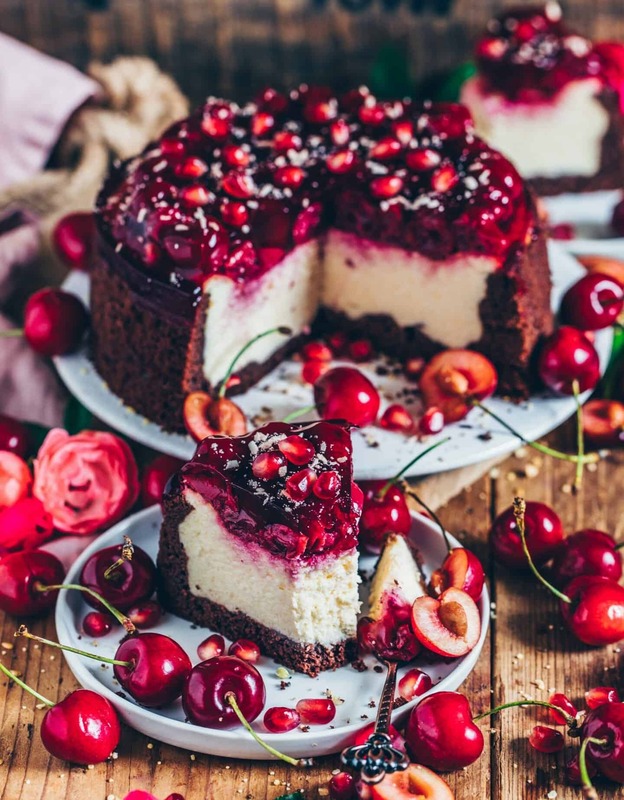 … especially with sweet fruits or slightly sour berries, cheesecake tastes great to me. Since the cherry season has just started, I am so in love with these juicy sweet red fruits. 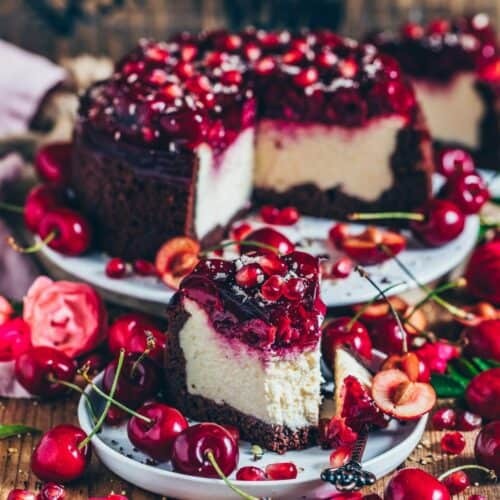 So I thought making a vegan cheesecake with cherries would be perfect. Well, I did not think long, but started making it right away! I really love my vegan blueberry cheesecake with almond brittle, but this time I wanted to make the vegan cheesecake layer without tofu. In my vegan cheese crumble cake with juicy berry filling, I have already made a thinner layer from drained soy yogurt (soy quark). I have now modified this recipe and added also some coconut milk and a bit of semolina, which makes the filling even creamier. Anyway, my recipe testing was successful, because I think that the consistency is very good. By the way, you can also make quark from any other vegan yogurt, such as coconut yogurt. And if you prefer making the filling with tofu, you can, of course, use silken tofu instead of quark. However, you should always make sure that the mixture is very smooth and creamy mixed before baking. These delicious fresh red cherries have really caught my attention right now. Maybe you already noticed it on Instagram. 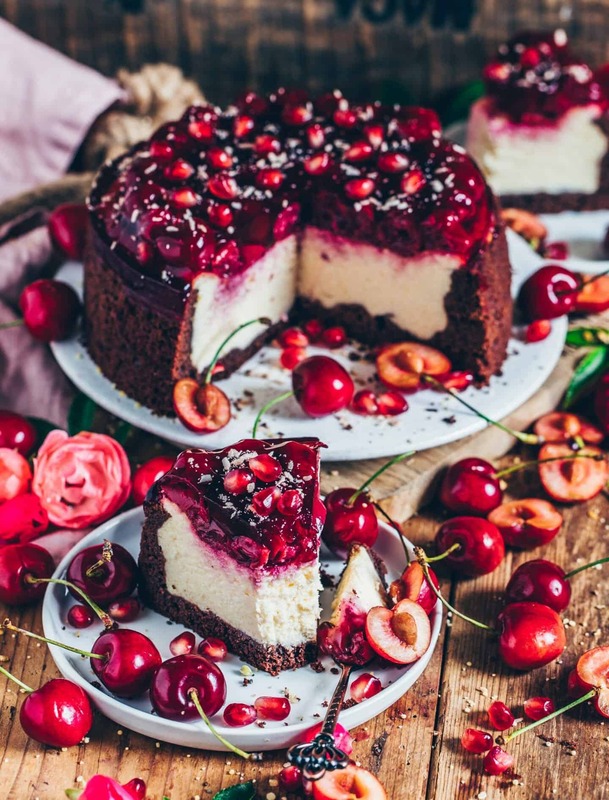 Whether as a topping on my oatmeal, toast, pancakes, mug cake or on top of my crepes … I think cherries are always suitable and above all so delicious! Do you agree? 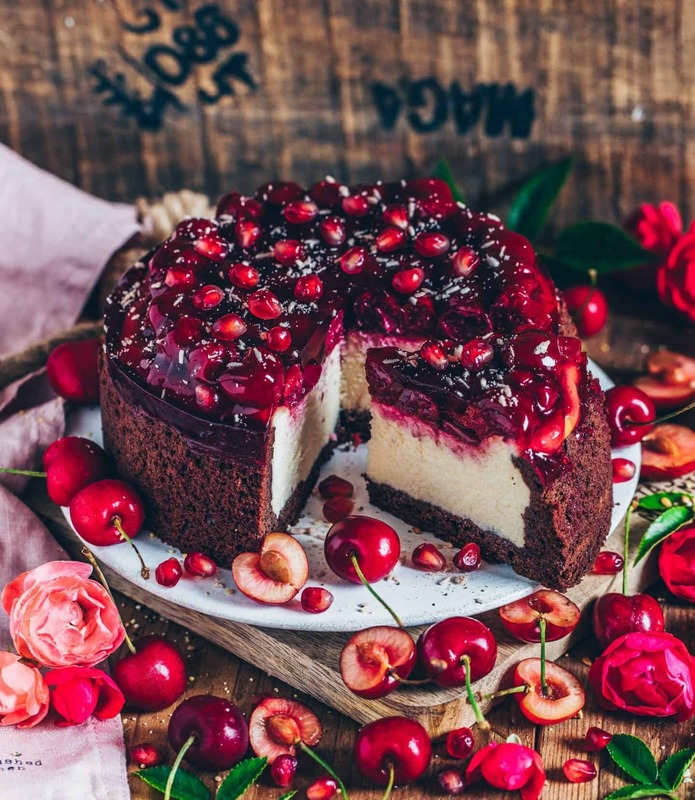 Of course, you can also use any other fruits or berries of choice for this cake. 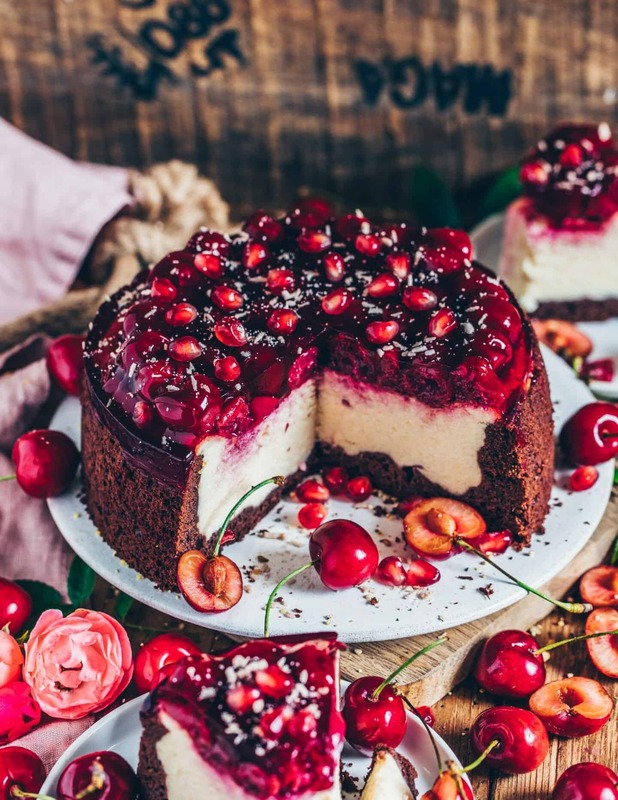 With strawberries, blueberries or raspberries, for example, the cake certainly will taste amazing too! 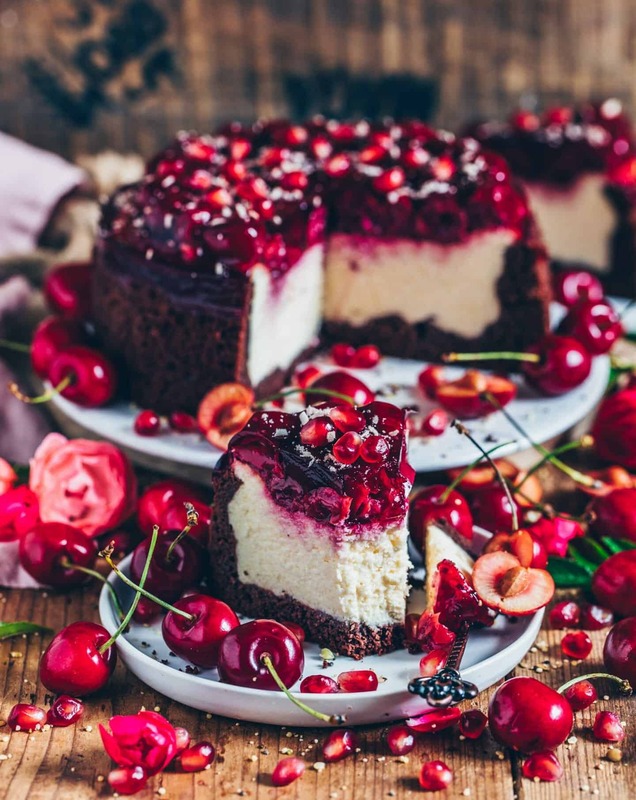 Incidentally, I used this vegan cake glaze,consisting of plant-based agar agar as topping for this vegan cheesecake with cherries. So the sauce is without gelatin and also vegan. For this recipe, I used a small 7-inch (18 cm) springform. But you can also use a 20 cm or 24 cm form if you prefer to have the cake a bit flatter and not so high. If you generally want to bake a larger cake (26 or 28 cm diameter), you can, of course, simply double the recipe as well. I have linked several types of bakeware that I use myself and recommend here -> ‘Kitchenware‘. If you try the recipe, I would be happy to read a comment from you. You are also welcome to post a picture on Instagram and link it to @biancazapatka so that I can see your amazing recreations. 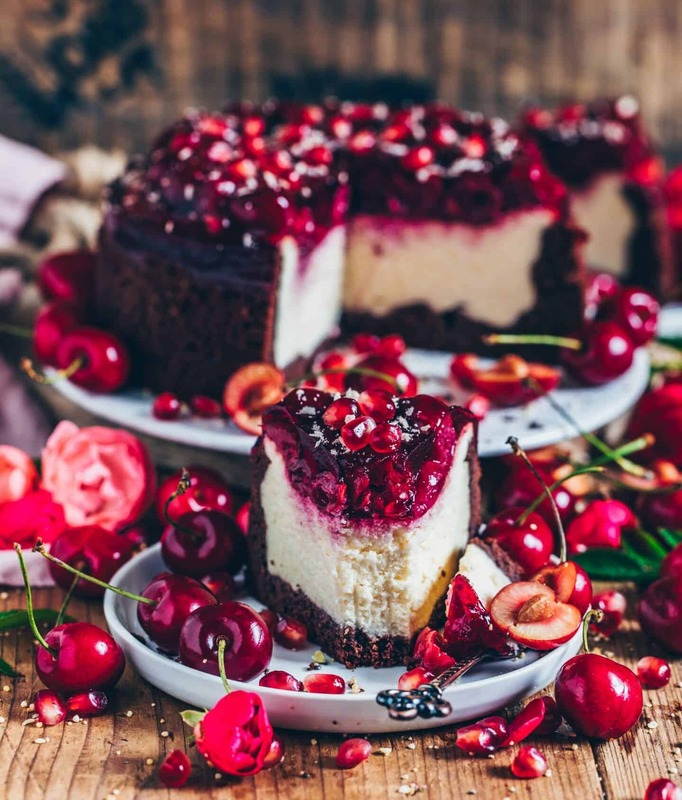 This baked vegan cherry cheesecake with chocolate crust is a delicious refreshing light cake with a wonderfully creamy filling and juicy jelly topping. Freshly chilled from the fridge, it’s a perfect dessert for warm summer days. 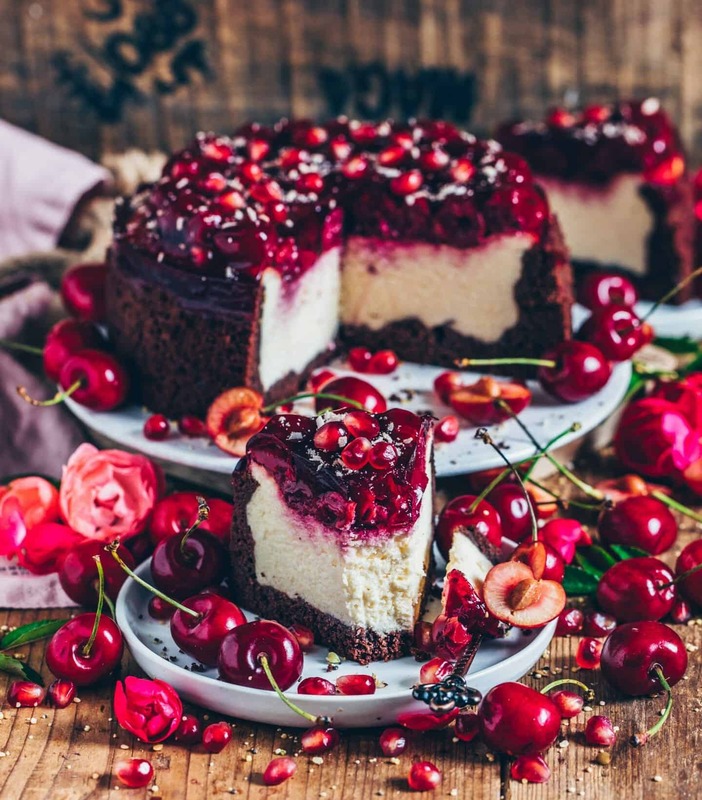 This cake is easy to make and dairy free. Knead all ingredients for the dough. Then form the dough into a ball and place it in the fridge for about 1/2 hour. Afterwards, spread the dough evenly in a greased springform pan and press firmly. Pull up the edges as you go. Slowly melt the vegan butter in a small saucepan and allow to cool slightly. Meanwhile, preheat the oven to 350°F (175°C). Now fill the soy quark, coconut milk, sugar, vanilla, pudding powder and semolina into a blender or large mixing bowl and mix well until smooth and creamy. Then stir in the soft vegan butter and lemon juice. Spread the filling on the base and smooth over. Turn off the oven and leave the cake in the closed oven for about 10 minutes more. Then open the door of the oven a little and allow to cool. Prepare the glaze according packaging instructions with cherry juice (or water + a bit of sugar) and let cool down a bit. Spread the cherries on the cooled cake and pour the glaze on top. Place in the fridge until firm. If you do not find any soy quark in the supermarket, you can simply drain about 26,5 oz (750 g) of soy yogurt for 12 hours in a strainer lined with a cloth. That should make approx. 17,6 oz (500 g) of soy quark. Of course, you can also use any other yogurt to make quark. Otherwise, you can also use vegan cream cheese or silken tofu. I used this vegan cake glaze. Optionally you can easily stir 1/2 tbsp of potato starch or cornstarch in 1/2 cup (125 ml) juice (or water + 1-2 tsp sugar) and bring to the boil. Instead of cherries, you can also use any other fruits/berries of choice, f.ex. strawberries, raspberries, blueberries etc. Leftovers can be frozen (best when you freeze in slices). When desired, you can defrost slowly in the fridge, then the cake stays nice and creamy. I’m always impressed by your photography skills, honestly. Your pictures are fabulous Bianca! Have fun trying the recipe!? Your pictures are incredibly beautiful! If you were to substitute the pudding mix with cornstarch and vanilla, how much cornstarch would 1/2 a packet of vanilla pudding powder equal? 50 grams? Loved this cheesecake. So easy to make! We do not have this product in my country. Can you please advise the amount of cornstarch? I don’t know what “1/2 packaging” means. 1/2 packaging of vanilla pudding powder means 20 grams of cornstarch + approx. 1/2 tsp vanilla extract. Is it possible to omit the butter in the filling? You could try it, but I guess the filling will be probably too runny and it won’t be so creamy. Is there a substitute you’d suggest? And thanks! I adore your recipes. Hi, I am baking your cake today. When you say 1/2 pudding powder, how many grams is the total? I mentioned that in the recipe notes. It’s 20 Grams. Enjoy your Christmas holidays.